This photo is from the collection of Ernest C. Baumert, who was chief of Maintenance and Engineering Branch for APC, was taken on September 28, 1955. 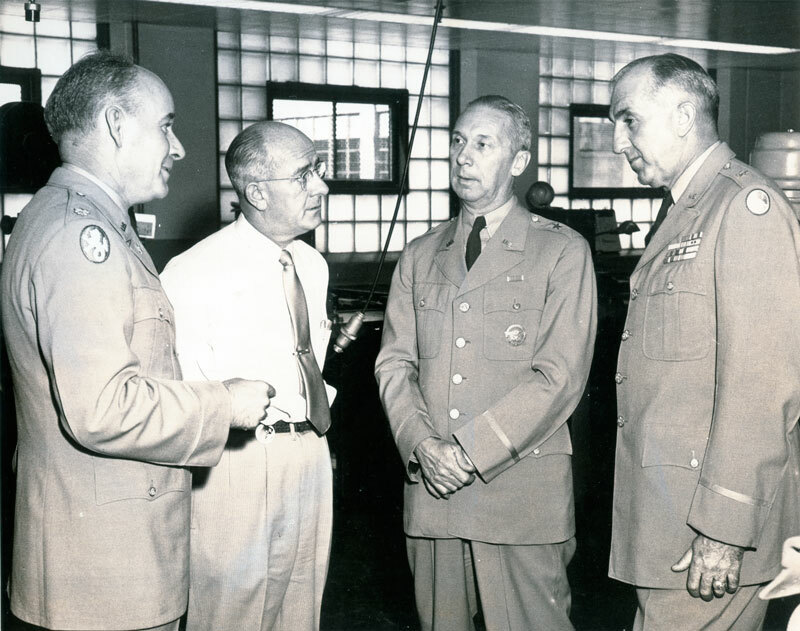 Pencil notations on the back of the photo identify the individuals as, from left: Major McEwen, Service Division, SCPC; Ernest Baumert, Maintenance and Engineering Branch, SCPC; Brigadier General Mayer, S. C. S. A., Philadelphia; and, Brigadier General Cassavante, P. D., Washington. "In October 1961 the Berlin Wall crisis happened and Operation Roundout started. All pictorial junior officers were sent to Europe. The APC CO gave me a present of MOSs 8510, 11 and 12, motion picture unit CO, director, producer. I think he liked the fact that I insisted on a salute during Saturday inspections. From that date on I was tagged as re-up material. I think there were only three of us with those three MOSs in the Army. Never did re-up though. I did work with Harry Franklin in France and Germany in 1962. Became a producer of short films after my tour, won a few awards, too. Then I produced a feature for Paramount. Made 2 cents and I went to law school. Had a ball at the APC. Rented a maid's room at the Sherry Netherlands Hotel (59th and Fifth Avenue) for $50 a month. That was when you could still park on the street in Manhattan."